SOCHI—The Americans made no bones about it — their goal coming into the Olympics was to win a gold medal. They believed it was their time, this was their best chance to do it for the first time in 34 years.That showed in the bronze-medal game. How, you ask? The USA didn’t seem to want to be there.OK, so that’s not entirely fair. The effort from the American team couldn’t be questioned too much after the first period. The USA had some good pressure and guys like Ryan Kesler were showing they were playing for the medal by saving goals with half his body and making himself a wall.Problem was, that effort didn’t continue into the final 40 minutes while Finland had no such issues. It was no surprise then that the Finns ran away with the bronze, outscoring the USA 5-0 in the final two periods.Never did that effort look worse than in the third period. Team USA entered the final 20 minutes only down two goals, still within reach at that point. Then the US had zero — ZERO! — scoring chances in the period. In total, the Americans only had five shots on goal. As a team that was losing. It got to the point that they were committing silly penalties and for the most part playing at half speed. At moments it looked like they were in an All-Star Game.Questioning the effort of the American players happened immediately. Even the players were doing it right after the game. Teemu Selanne scored the first of his two goals to open the scoring.After a scoreless first period that was played pretty evenly, Finland began the second by killing the remnants of an American power play. Seconds later, the ageless wonder Selanne was a step behind the American defense and finished a shot past Jonathan Quick with a near-post back-hander, a thing of beauty. Compounding the issue for the USA was that just 11 seconds later Jussi Jokinen made the game 2-0 when the USA looked lost in the neutral zone.The Americans pushed for the remainder of the second period but were unable to score against Tuukka Rask and that stout Finnish defense and by the time the third period came, the Americans looked like they had given up. Finland poured it in getting goals from Jusso Heitanen, Selanne again and finally Olli Maatta to wrap up what was a route to win the bronze.It is the fourth time in the last five Olympic Games since the NHL has participated that Finland comes away with an medal.The best chances for the USA came on penalty shots. The United States got a shot at one in the first period when Kimmo Timonen shot a broken stick at Ryan Kesler, who had the puck, which results in an automatic penalty shot at the international level. Patrick Kane took the attempt but hit the cage. In the second period, Kane would get another attempt at a penalty shot when his breakaway attempt was interrupted by a slash from behind. Kane elected to shoot and he had Rask beat up high but the puck hit the cage and stayed out. After that, the USA had little to speak of.Rask ended up making 25 saves in the game for the shutout.USA came into these Olympics with very high aspirations but it ended the same as just about every other Olympic tournament held outside of North America, without a medal. “I think it started yesterday, we didn’t show up to play a tough team in Canada and lost that game,” captain Zach Parise said to NBC Sports after the game. “Just today, I thought we had a pretty good start but once we gave up that first goal, we kind of deflated. They played like they had something to win and we just kind of shut it down. Goalie Jonathan Quick, who was hung out to dry a few times, was equally harsh. Excuse the effort away as being in a bronze-medal game all you want but the fact is Team USA was still playing for something and didn’t show up for the final two periods. Normally the cliché of “that team wanted it more” is so ridiculous and almost insulting but in this case, it’s indisputable. The Finns wanted it more than the USA and they got it.Still, it is hard to read a ton into the bronze-medal game other than the teams’ desire. If the US and Finland played in a different setting, perhaps in the knockout round or in pool play, it’s probably not a five-goal difference. That’s something to consider.So when you look beyond that game, there are still some big concerns. What’s as distressing as that effort was the fact that the USA offense disappeared. They were shut out in the final two games. Granted, those are two very good defensive teams but still, no goals in six periods. 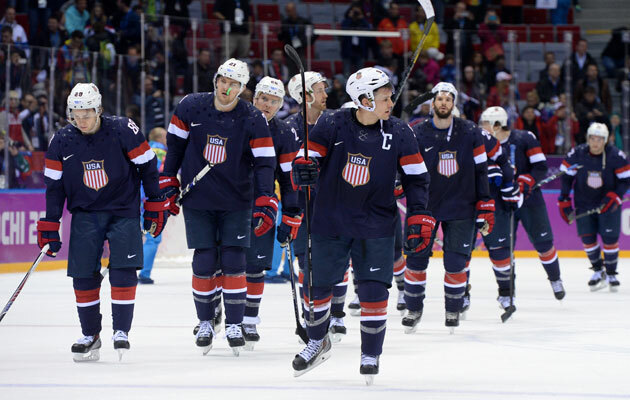 Against the trio of Canada, Finland and Russia, the USA had no goals at even strength.Based on where Team USA has looked in tournaments outside of North America in the past, there are ways to try and look at a fourth-place finish in a rosy manner. But in a testament to USA Hockey, medals are the expectation now. That wasn’t always the case but it is now. So even though they fared better than in Turin in 2006 or Nagano in 1998, it still feels disappointing, especially to end the Olympics on that note in the bronze-medal game.The fact is the United States still brought a very strong team to the Olympics and assuming the NHL will return in 2018, is still going to be in the conversation, especially as the young players that made up the 2013 World Junior Championship team mature. Tempering the disappiontment with perspective is important.But ending on that note, getting shut out by a combined 6-0 in two medal-round games stings. A tournament that started so well for the USA ended as one to forget.